Tarantulas are not for everyone, but the brave folks who keep them as pets love them as much as anyone can love a spider. Tarantulas, though they look quite fearsome and strike fear in the hearts of many, really are quite fragile and can suffer injuries during molting. Molting is a natural process experienced by animals with an exoskeleton. As the animal grows, the outer shell, or carapace, does not grow with it, so it must be discarded in favor of a newer, bigger one. This process of molting involves the animal shutting down for a time while he sheds his outer skin and emerges with newer, softer skin, which will quickly harden into a new exoskeleton. 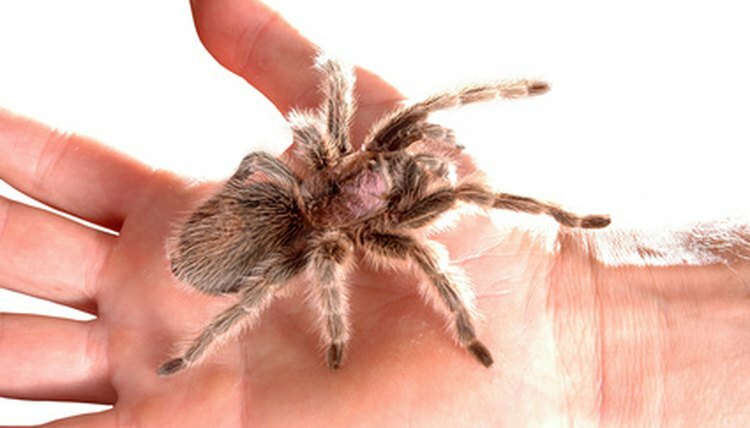 Tarantulas molt about every six months and some continue to molt throughout their lives. When Mother Nature tells the spider it's time to molt, the spider begins to secrete special hormones and fluids that will help him evacuate the old shell. He will roll over on his back and you may see some silk around him. Do not disturb him as he is very vulnerable during this process, which can take anywhere from 15 minutes to a few hours. It's a complicated and dangerous time for a spider. The most common problem during molting is for the spider to get stuck inside the old carapace. Most of the time it's just a small part of the body that is stuck, but sometimes the spider actually can become trapped inside the old carapace, which leads to a slow death. Molting problems usually are caused by a lack of sufficient hydration, or humidity. Molting requires lubrication, and without proper levels of humidity, 60 percent or higher, the process cannot continue. Spiders with regenerated legs, older spiders and malnourished spiders all are at a higher risk for molting injuries. The only time you should intervene during molting is if you see your spider having obvious trouble extracting himself from the outer shell. Gently apply moisture to the area where he is stuck, using a wet paintbrush, to help separate the old shell from the new skin. Another common problem occurs with one or more of the legs during molting. If you see your spider having difficulty extracting a leg from the inside of the carapace, gently pull the old shell off the leg using a tweezers. Do this only if you see your spider has completed the molting process and is having trouble. If your spider has a deformed leg after molting, which happens sometimes with juveniles, wait a few days to see if it falls off on its own. If it does not, remove it with a hemostat or tweezers. If you don't, he will have trouble during his next molt. Keep your tarantula well-nourished and hydrated at all times. Always offer fresh water, even if your spider appears to ignore it. When he needs it, he needs it desperately and if it's not available he could be in big trouble. The water should be offered in a shallow saucer so he can lower himself into it to drink. The ambient humidity should be at least 60 percent or higher. Remove any uneaten prey in the tank, as crickets and other insects are criminals of opportunity and will attack the spider when they see him go into molting mode. Know the signs when your spider is about to molt so you can be prepared: he will stop eating and become lethargic. The carapace becomes transparent and may split. His abdomen will darken and he may spin a web. Keep a close eye on him from a distance and watch nature take its amazing and spectacular course. Does a Spider Have Bones?